A lot has happened during the last 7 days. Most importantly Max’s first tooth arrived. It just peeked out yesterday. It is one of the lower incisors. On Friday Max visited our new family doctor. Dr. Nishimura did a basic check-up and everything is OK. Luckily there were no shots required this time. Max weights now 9.5 kg (about 21 lb) and is 74 cm (29 inches) long. On Monday Karen started to work as a Services Marketing Manager at VMWare. Max is staying during the day with Victoria and his buddy Lukas. 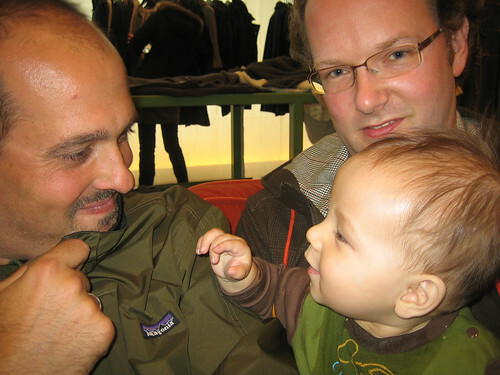 On Saturday Max, his godfather Andre, Karen and Matthias went shopping in San Francisco. While Karen was trying clothing at the new Barney’s New York store Max had fun with Andre. This entry was posted on Thursday, September 27th, 2007 at 5:11 am	and is filed under Baby, Friends. You can follow any responses to this entry through the RSS 2.0 feed. You can leave a response, or trackback from your own site.